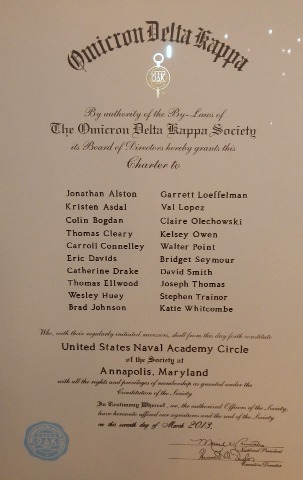 The Naval Academy received its official Omicron Delta Kappa charter on March 7th, 2013. The society’s ideals have long been practiced by Naval Academy midshipmen and faculty, making the society a natural extension of what has been lived by people associated with this institution and the Naval Service. In its inaugural installation ceremony, the Naval Academy inducted nine faculty members and eleven Second class Midshipmen. In order to grow the chapter and honor both Midshipmen and faculty for their leadership excellence, LEAD division conducts an annual new member induction ceremony. Omicron Delta Kappa, the National Leadership Honor Society, was founded at Washington and Lee University on December 3rd, 1914. In the tradition of the idealism and leadership of George Washington and Robert E. Lee, the society’s founders stated that leadership of exceptional quality and versatility in college should be recognized, that representatives of all phases of college life should cooperate in worthwhile endeavor, and that outstanding students and faculty members should meet on a basis of common interest, understanding, and helpfulness. The success of the Ο∆Κ idea, an essential part of which is its joint student-faculty character and a determination to maintain a consistent and high standard of leadership recognition, has led to the establishment of chapters at colleges around the country, over 300,000 members, and a national convention hosted by an Ο∆Κ chapter every two years.